Former Virginia Tech Hokies and Florida Gators defensive backs coach, Torrian Gray accepts job with the Washington Redskins. The Washington Redskins have announced the hiring of former Florida Gators defensive backs coach, Torrian Gray as their new defensive backs coach. 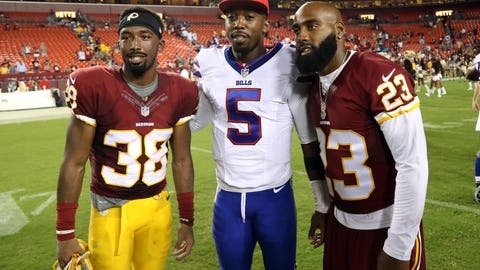 Prior to being in Florida for one year, Gray was with the Virginia Tech Hokies from the 2006-2010 seasons where he coached current Redskin, Kendall Fuller. Fuller was a second-team All-America in 2014 who was chosen by Washington in the third round of the 2016 draft. Most people however think this will be Gray’s first NFL coaching gig … they are wrong. His first NFL coaching job came in 2004 where he spent two seasons with the Chicago Bears as their assistant defensive backs coach under Lovie Smith, who is now the head coach at Illinois. Several defensive assistants were fired following last season, and Greg Manusky was recently named as Washington’s new defensive coordinator. Manusky was the team’s outside linebackers coach last season. The Redskins now have all major coaching positions set entering the 2017 season. They aren’t likely to hire a linebackers coach and new defensive coordinator Manusky has emphasized that he’ll spend a significant amount of time with the linebackers. Gray replaces Perry Fewell, who was fired as the defensive backs coach along with defensive coordinator Joe Barry on January 5. Assistant defensive backs coach Aubrey Pleasant was the favorite to land the job according to multiple reports but after the negotiations broke down, Pleasant ended up joining the Rams coaching staff. Gray has a strong resume and will add to that knowing that some of his former players will be entering in this years NFL Draft. Those players being, Hokies’ safety Chuck Clark who is projected to be a mid-to-late sixth or seventh round draft pick, Florida’s cornerbacks Jalen Tabor and Quincy Wilson along with Florida’s safety Marcus Mayne.